I've been asked about the Trinity more than once and, as you can imagine, I've given more than one answer. It's always a tough concept to talk through because I am trained, for better or worse, to start from what the Bible teaches about a given subject and in this case it's not taught in scripture, it's inferred. Though it's not completely clear or articulated in scripture it cannot be ignored. for example, Jesus said "therefore go and make disciples of all nations, baptizing them in the name of the Father and of the Son and of the Holy Spirit." What could a statement like that have meant to a first century monotheistic Jew? Because of passages like this, it makes sense that the trinity was one of the earliest Christian doctrines to be established, at least by 325 at the council of Nicaea. Whenever I am asked about the doctrine of the trinity, I always find myself dissatisfied with whatever answer I give. Either my explanation seems to trivial, too simplistic, not "biblical" enough, or just plain unimportant. I don't know how to explain the importance of trinity. Yeah God is three persons... whatever that means... so what? What does that change? I guess there's a good reason that trinity is hard to teach... because it's not meant to be taught but prayed. The trinity must be prayed, and thus lived, in order for us to find any level of understanding. Perhaps the trinity is more of a lens than a doctrine... it gives us a way to see and participate in God's work. We begin to see the wind of the Spirit blow through our lungs as we embrace the Son in the face of the poorest of the poor with the hope of our vindication from the Father. As we live and pray trinity we live and pray in relationship, we live out the eternal community of the trinitarian God. We see trinity and that is where we begin to believe it. I found your blog by accident, but I was intrigued by your latest post. TO say that the Trinity is not to be taught is not quite right. The earliest ecumenical articulation of the Trinity is certainly doxological (the Nicaea-Constantinople Creed, Nicaea didn't say much about the Spirit). However, the fathers had much to say about the Trinity. You should start with Basil's On The Holy Spirit. Though the Chalcedonian definition is primarily about the person of Jesus, I think the same things can be said about the relations of the persons of the Trinity as well. What we would want to avoid is explaining away the Trinity. 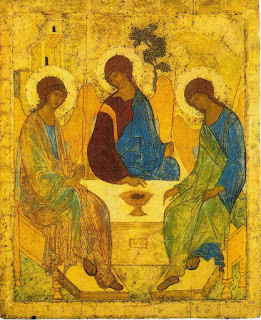 Our explanations should make the doctrine of the Trinity seem deeper, not shallower. And hopefully our secondary theological reflections will make our primary theological actions (pray and worship) more vibrant and mysterious. Thanks for a great post and a good break from writing. Been a long time but I do stop in from time to time thought I would comment. The Trinity can be baffling to say the least and explaining it should not be done in minimalist terms. Part of the essence of the Godhead is to drive us to deeper complexity from His singular - simplicity. The nature of creation reflects that. White light through a prism produces the many variations of lights frequencies - colors, observation of life in microscopes reveals realms of life discovered only with investigation careful investigation not by the equivalent of information given us as sound bits. The surface - shallow culture we live in dictates we give explanations in that format. The suggestion of reading the Fathers is good. The generations prior to today’s saw the value of investigative understanding. There is a story that St. Augustine was walking on the beach contemplating the mystery of the Trinity. Then he saw a boy in front of him who had dug a hole in the sand and was going out to the sea again and again and bringing some water to pour into the hole. St. Augustine asked him, “What are you doing?” “I’m going to pour the entire ocean into this hole.” “That is impossible, the whole ocean will not fit in the hole you have made” said St. Augustine. The boy replied, “And you cannot fit the Trinity in your tiny little brain.” The story concludes by saying that the boy vanished as St. Augustine had been talking to an angel.